Born in November 1891, William Harold Coltman was enlisted into the British Army in the First World War in 1915. As a conscientious objector, William’s religious beliefs prevented him from taking up arms. Still keen to help, he became a stretcher-bearer, performing incredible feats of bravery as he charged alone and unarmed into the path of enemy fire; tending to wounded comrades and carrying them back to safety (on his own back). 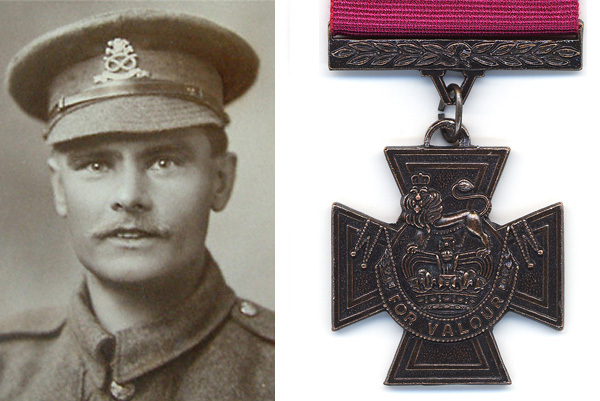 William was awarded the Victoria Cross – the highest award for gallantry in the face of the enemy – and became the most decorated enlisted man of the First World War. William’s awarding of the Victoria Cross was published on page 308 of The London Gazette on 3 January 1919. I love this story because it demonstrates that we all have the ability to become a leader and make a positive impact on the lives of other people – no matter what our position, ability or beliefs. At times we may feel like we don’t have the most important job in the world, but opportunities to make a difference are around every turn and it’s all about how we act upon those opportunities that shapes who we become. I believe that making a positive impact on someone’s life is the most rewarding thing you can do. Our world is full of chances to do just that, on all sorts of levels. Try volunteering, donate to a charity, or even buy a homeless person a sandwich. Believe me when I tell you that random acts of kindness, of whatever size, can be incredibly fulfilling. Your reward will be in the form of a greater sense of being – you feel alive. It’s a win-win. We live in a fast-paced world where people feel increasingly fractured and segmented from society as a whole – often looking for validation and recognition from social media to fill the void. Making even a small difference to the life of another person helps create a connection back to the world – you’ve created something and made a difference. We don’t all need to be looking to have the impact that William had, nor will we have the opportunity to do so, but there are many ways to find and release your inner hero. William’s story is as inspiring today as it was a century ago. No matter what our views, we can all aspire to make a difference in both our work and personal lives.